Steadfast characters believe the same thing that drives them should drive everyone. Everyone agrees that the Main Character is the most important character in a film. Why? Because through this person, an audience experiences first-hand the emotions and consequences of the narrative surrounding them. But there is another, less understood character that is primarily responsible for influencing growth in the Main Character. This character is known as the Influence Character. When the Influence Character is steadfast, then he will make his arguments to the Main Character in reference to his own drive. He will treat his own drive as if the same things should be driving all others as well. This part I knew and understood but it was what came after it that made me stop and think, “Why hadn’t I seen that before?” I’ve been working on and off with Dramatica for over 10 years now and probably have read the following line a million times. But for some reason it never really resonated with me until last week. Is that true? Is it really that black and white? “We’re alike” if the Main Character changes and “We’re nothing alike” if the Influence Character changes. Is it really that easy? Overall, I understand that this is a generality and therefore shouldn’t be taken as a strict rule of dramatic narrative, but it started me thinking. How did this generality hold up under further scrutiny? And more importantly, could it help me with my own work? I took six Influence Characters, three who Change and three who Remain Steadfast, and applied the above axiom. Score one for Marshall Samuel Gerard in The Fugitive. Chasing Richard Kimble (Harrison Ford) in and around Chicago I could hear Tommy Lee Jones uttering “We are nothing alike Richard.” Gerard is not the type to suggest that he and a fugitive wanted for murdering his wife are anything alike. It would be quite strange to hear him say so. Robert the Bruce (Angus MacFayden) from Braveheart?…hmmm. “We are nothing alike, William Wallace (Mel Gibson).” Perhaps deep down inside his shameful self might feel that, but I don’t recall him ever saying it aloud. Instead the voice of disparity comes from Robert’s father, the Leper. Robert wishes to join Wallace but his father reminds him that Robert is a noblemen, not some commoner like Wallace. “Uncompromising men are easy to admire…But it is exactly the ability to compromise that makes a man noble.” As his father puts it, Robert and Wallace are nothing alike. 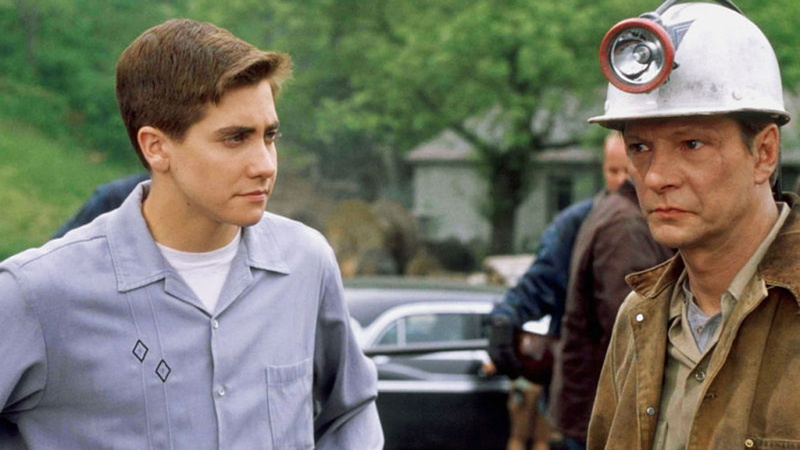 Looking at October Sky Coal-mining father John Hickam (Chris Cooper) certainly doesn’t feel like he and his son Homer (Jake Gyllenhaal) have anything in common. John considers himself more of a practical man while Homer has head (and his rockets) in the clouds. Again I believe he even has a conversation with his wife about how he and his son are nothing alike. And now we move on to Lester Burnham (Kevin Spacey) from American Beauty and his own “personal hero,” Ricky Fitts (Wes Bentley). When Ricky’s boss threatens to fire him for not working, Ricky tells him, “Fine, don’t pay me. I quit. Now leave me alone.” Words Lester wishes he could say to his own boss. Ricky doesn’t come out and say “You and I are alike,” but he might as well have. What about the obviously named Cole Sear (Haley Joel Osment) and his relationship with the troubled child psychologist Malcom Crowe (Bruce Willis) in The Sixth Sense? In the classic hospital scene, Cole asks “Tell me why you’re sad.” At first Malcom refuses, but soon realizes that Cole is just as sad as he is; perhaps opening up could help the young boy out. Again, the words aren’t said but the intention is there. And what about Andy Dufresne (Tim Robbins) from The Shawshank Redemption? Before he tells Red (Morgan Freeman) about Zihuatanejo he talks about the whirlwind tornado that fate dealt him. “I just didn’t expect the storm would last as long as it has.” We cut to Red, his head hung low. And although we can’t read the expression on his face, we know for certain that Red feels the same. Personally I like it much better when you can do the “You and I are alike” line without actually having to say it - part of the reason why I chose these examples. So does the rule work? It seems like it does. I mean, you can’t imagine Ricky telling Lester “We’re nothing alike” or John Hickam telling his dreamer son “You and I have so much in common. Let’s sit down and talk about our dreams.” Still, it’s probably not a good idea to rely on it all the time, but I do think there’s a real world reason for why the rule works so well. The character who has the most to lose (or gain depending on how you look at the Change) is more often than not the one who will resist any notion of similarity between the other. When someone tells you, “You know, you’re acting just like so-and-so” and you react with disgust or disbelief, chances are that so-and-so is your own personal Influence Character. We hate seeing a part of us that we don’t quite understand or even want to accept. This resistance is a resistance to Change and depending on which side of the argument you stand, you’re either going to be a proponent for it or you’re going to speak out against it. That’s one of the main reasons why the Influence Character exists: to provide that other side of the argument. So it’s comforting to know that with a few simple words (“We’re both alike” or “We’re nothing alike”) you can easily tell which side of the argument this second most important character stands on.